We invented a self-watering planter box for growing all kinds of vegetable. The box stores around 10 litres of water so no need watering for several days even weeks. More importantly, by up-cycling materials: styro-foam boxes from local fruit and vegie shops and a piece of plastic pipe from kerbside we divert stuff going to land field. 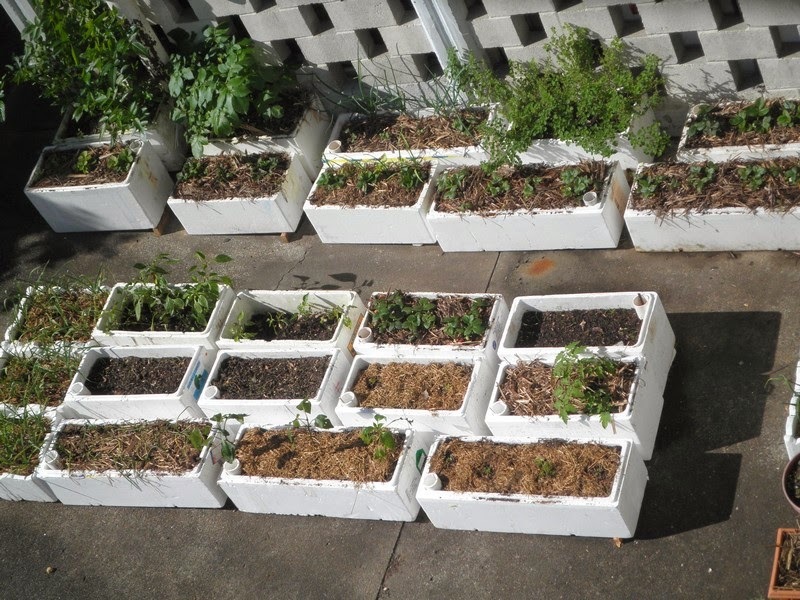 Vegetable thrive in these boxes as they have constant wet feed from the bottom encouraging plant roots growing down rather on a surface. It's also water efficient as only water used is by plants - no evaporation or water run off. The planter box retains nutrition during rain while in a garden bed they leach out. Also soil never get bogged and a float indicates amount of remaining water. The self-watering planter boxes are mosquito proof - the float in watering-in pipe and fly mesh from in the overflow hole. 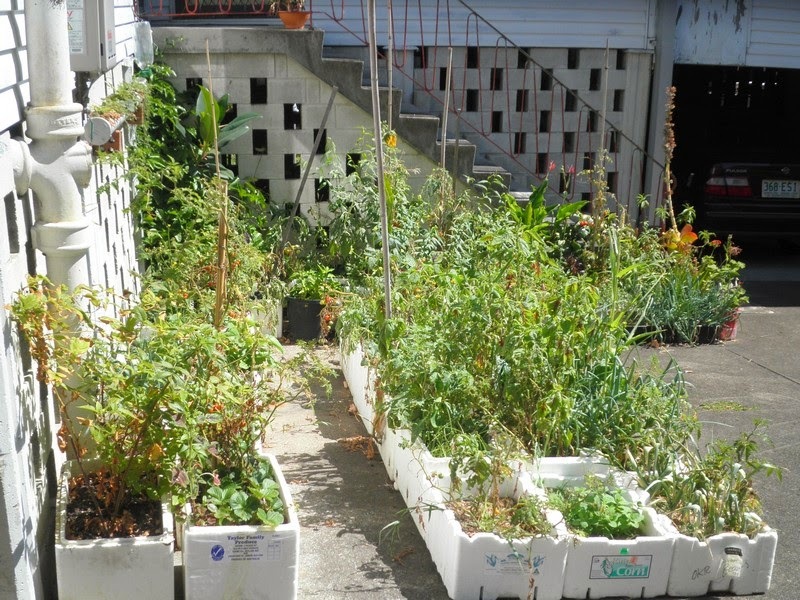 These boxes are perfect for balconies and patios also in places where soil is so bad that nothing would grow there. We successfully grow vegetable on a concrete yard in full sun with no shade even during hot summer. How to make self-watering planter box from recycled materials in 5 minutes? 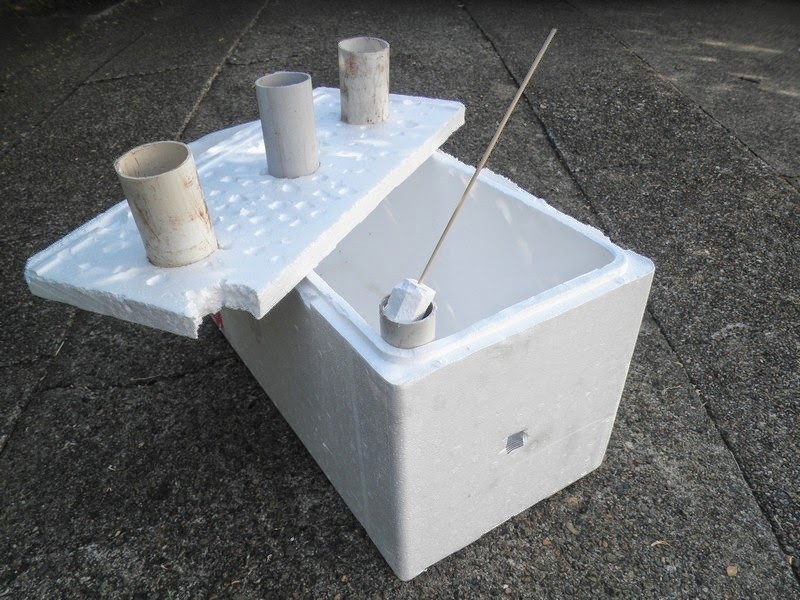 It is so simple, get a styrofoam box and a piece of pipe. We use a broccoli or salmon boxes, 50mm PVC pipe and a wooden skewer. - Cut the lid to fit in the box by sharp knife. - Make three holes for pipes in the center line of the lid. Make sure holes are slightly smaller than PVC pipe so the lid does not slide. Use a smaller diameter pipe or the end of a silicone tube, which works well for 50mm PVC pipe, to cut holes. - Cut a corner of the lid to fit a watering-in pipe. - Punch randomly holes in the lid by a screw driver. - Cut three or four pipes (legs) about 10 cm long by a hand saw, the watering-in pipe length to fit box height about 30cm. - Place lid with pipes down into the box so it creates a raised floor. Add watering-in pipe into a corner. - Make a float. Use a styrofoam off-cut and shape it into circle of smaller diameter then pipe. Stick a wooden skewer in it. Slide it into watering-in pipe and cut the top of the skewer at the same level as the watering-in pipe. - Make a overflow hole into a side of the box at the same level as the raised floor. It's handy to have watering pipe and overflow hole on the same side of box. Fill in pipes with soil thoroughly then add soil to the top of the box. Soil will act as a wick (by a capillary effect) bringing water up to plants. A float indicates how much water is in the box. The overflow hole in the side of the box allows overflow when watering in or during long rain when the water storage fills up. 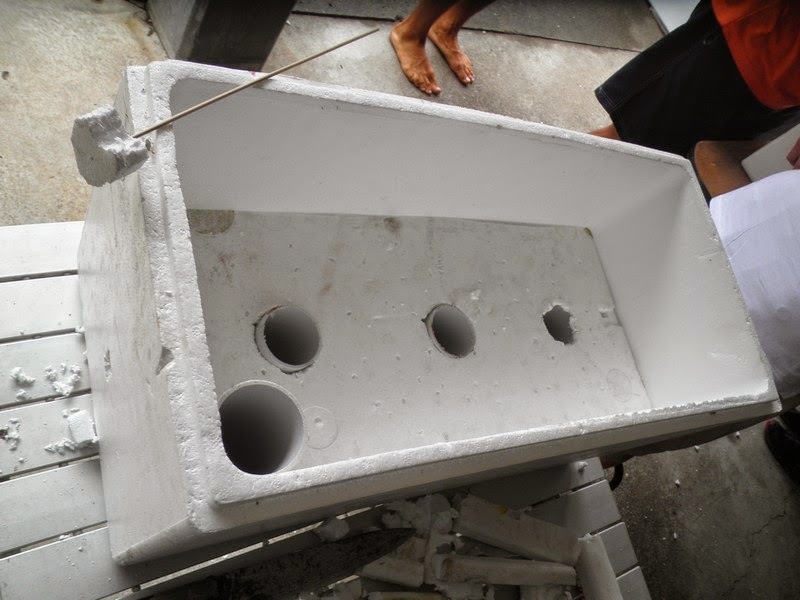 Punched small holes in the lid provide drainage and an aeration of soil from the bottom. You can paint the box on outside to make it last longer. Ours are without paint and still in good conditions after a year of use. 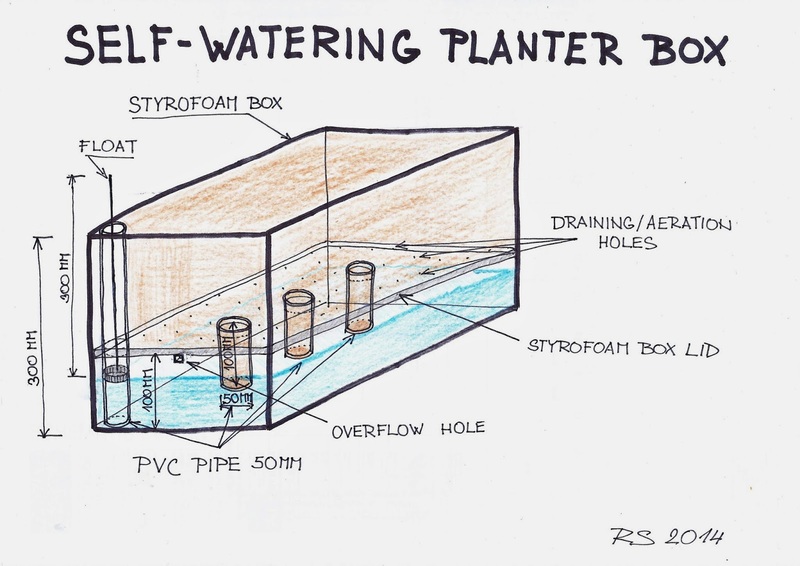 This is the cheapest (using recycled materials for free), the most effective (10 litres water stored) and insulated (styrofoam is a great insulation) Self-watering Planter box we know of. We have been using these boxes for a year and successfully growing organic and healthy vegetable such as: capsicums, chillies, tomatoes, eggplants, cucumbers, leeks, onions, garlic, strawberries, beans, lettuce and other leafy vegies and herbs etc. Thank you so much for this detailed information and most generous of you to share your very own invention with us all. I have several Styrofoam boxes that I will use this summer. I just found your blog today from the down to earth blog and I am finding it very inspirational. I have got the boxes and will doing this as soon as we move house next week - thank you!! And also would you ever just do plain foam non-self watering....ie just put soil into the box and hand water or rely on rain? Yes, we grow vegi also in plain foam boxes. They have to be watered regularly though which is obviously not an issue with self-watering planter boxes. you can see moist soil around the (beetroot) plants but it is dry at the edge of the box. I used 2 small plastic pots as my wicking mechanism btw. 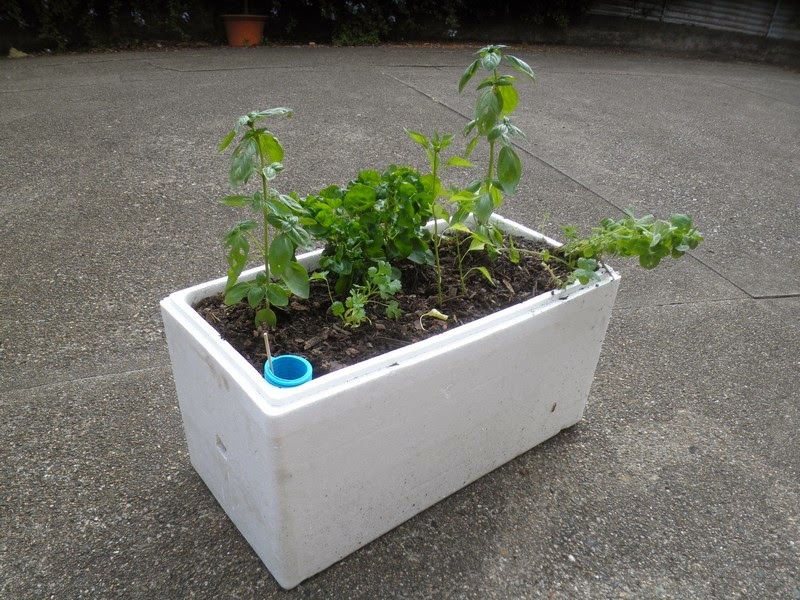 Here is another positive comment from Helen Gilmour on self-watering planter box. "Just a quick good news story for all the Spurtopia folks. We are in a hot spot ( Greenbank) and the ground temps went to 44 yesterday. Had the hose on the poor hens regularly and water out for the wildlife. The self watering planters I made from the design here stayed moist throughout the whole period. Only the top 2-3mm under the mulch was dry, the rest was moist to touch. I didnt expect anything to survive yesterday and was really great to see how well they work under the hot and dry conditions. I will be making more especially for green leafy veges over summer. Thanks for the tip, sharing your ideas." Thanks so much for this wonderful idea. I will definitely be giving this a go. I am having a hard time finding PVC pipes like the ones you used, could you tell me where you got them? I used small pots as wickers instead of the PVC pipes. I cut the holes in the lid insert a little smaller than the small pots. But I think you could even use sturdy yoghurt pots or similar with holes punched in the bases as well. For the watering tube at the side of the box, you could use any type of tubing, as long as you can get a hose in it to fill up. I have even seen narrow water bottles with the tops and bottoms cut off and joined to make a tube. Leafy vegies such a lettuce and shallots just love the styrofoam system. I cut my shallots off at ground level and they regrow! Bonus. I have also painted my boxes to blend in with my backyard garden. Suzanne I use recycled soft dring bottles as the tubes. Easy to cut with sissors to form a tube and they are food grade plastic. I use a full bottle with holes in the bottom as the watering tube and leave the cap on to prevent evaporation. I use my husband's soldering iron to do the holes as its easy. Takes all of 15 mins to make one. I have 26 of them on the grow and its just wonderful. I have also adapted the idea to make self watering buckets from the Bunnings 95c buckets, just cut a circle of foam to fit 8cm up from the bottom, one watering tube and a single outlet hole for overflow at 8cm. Grew a bumper crop of capsicum and cherry tomatoes in them this summer. Thanks Spurtopia for the idea. PVC pipes we use are from kerbside collection and offcuts from a plumber. You do not need to use pipe though, you can use planter pots instead so the raised floor will rest on them. Hope this helps. A self-watering planter box is a good idea. It would definitely help you to save time, since you wouldn't have to be out there watering every day. It would also help to eliminate some of the stress associated with growing your own fresh produce, since you would have one less thing to think about. It's good that it retains nutrition in rain. Styrofoam is plastic and every plastic leachs something. So though it might not be ideal, I would say that vegi grown in these boxes is still thousand times better than heavily sprayed vegi from shops. Not even mentioning broccoli which is supplied in these boxes and is in direct contact with styrofoam. A quick question (which may be a stupid one). If the bottom of the PVC pipes are touching the bottom of the box, how does the water get into them? There wouldn't be a gap if the pipes are sitting flush and even. Great idea! Do you mind if I include your photo and a link to this tutorial in a blog post I'm writing about gardening ideas?